This past weekend's adventure took us to Año Nuevo SNR located between Half Moon Bay and Santa Cruz on Hwy 1. Año Nuevo is not your typical coastal state park. 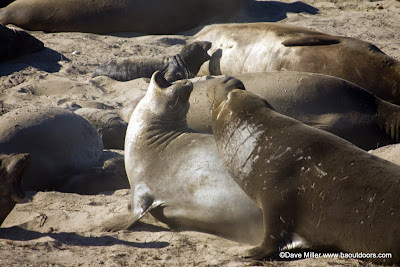 Although there are hiking trails and nice beaches, the main feature of this park is that it is the breeding grounds for a large colony of Northern Elephant Seals. 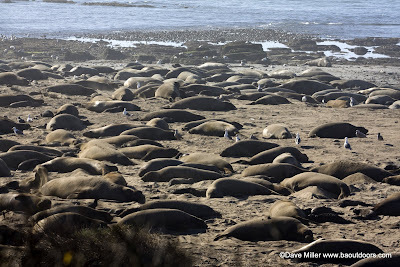 Every winter hundereds of elephant seals come to the beaches of Año Nuevo Point to molt, give birth and mate. As you can imagine, the park is a very popular destination, not only for us Bay Area enthusiasts looking for something to do, but also for people from all over the world who come to this part of the coast to partake in a live "National Geographic" experience. 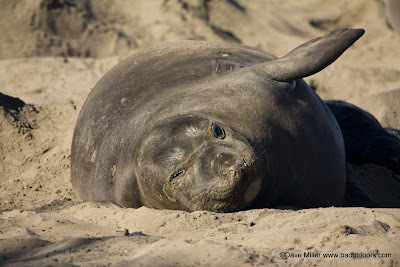 To regulate the flow of visitors during the peak times (December 15- March 31), the park provides/requires guided walks to view the elephant seals in their natural habitat. The cost of the tours are $7.00 per person, plus $7.00 for parking. Reservations are recommended, if you don't have a reservation, get there as early as possible (first tour is at 9:00am). The hike to the elephant seals is about 3 miles round trip, half of it walking on a trail and half on sand. It is a pretty easy trek. The best times to come to the park are from late December to early February. That is when the animals will be at their most active. 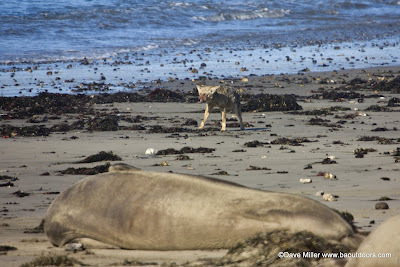 It is not uncommon to see the Bull seals battle for a harem or watching a seal being born. On our visit we saw some bulls jockeying for position, but no real fights. We did see a lot of newborn pups (first picture above) and even some amorous males (right). 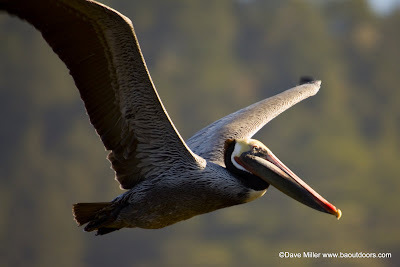 There are more than just elephant seals at Año Nuevo. Many sea birds and other mammals can be seen within the park. 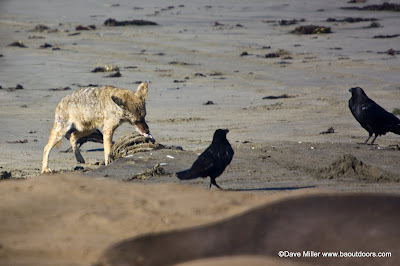 In fact, we had very special encounter with a coyote (left). 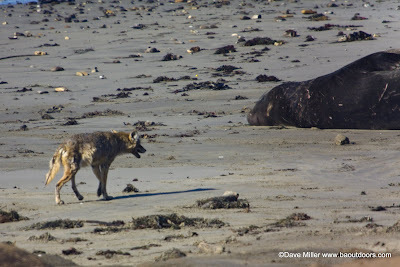 While approaching our first group of elephant seals near the beach, one of out party spotted a coyote coming towards us on the beach. Of course, that got my attention! I sure was glad I had my zoom lens with me. The coyote made a bee line for an area just out of view. We soon saw that he was feeding on some sort of carcass and at one point had pulled a rib cage into view. He certainly had his fill and headed in the reverse direction after about 20 minutes. Wow! 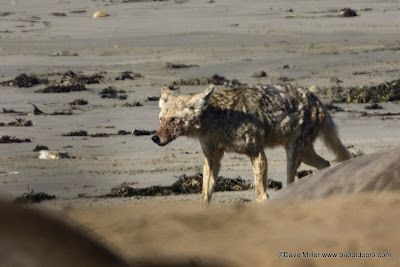 Below are more photos of the coyote with his 'brunch' in addition to a few other select shots. You can check out many more photos on my Picasa Web Albums. Año Nuevo is a must do on any list of outdoor adventures. 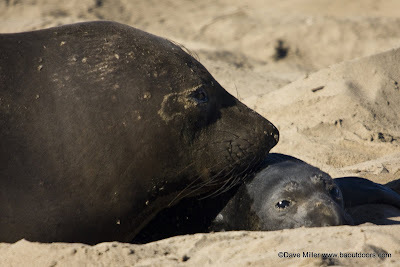 In fact, you still have time to check it out this year before the elephant seals head back to sea. I encourage everyone to go and participate in your very own National Geographic Experience! We finally see what he was chomping on. Not much left. Done for now. Heading back with a full stomach. Face off. Too bad, the one on the left backed down right away.